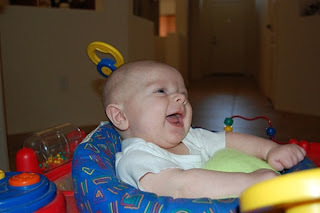 Our son Liam was born with a very mild version neck condition called Torticollis; his left neck muscle has developed a little more slowly than the other causing him to favor his right side. Due to this next condition, his head became flat and misshapen in certain places. When we first noticed that his head was flat, we chalked it up to the way he was delivered (with suction). He had what looked like a conehead but we were told it would go away in about a week, so we did not worry. The conehead did go away, but the shape of his head was not normal. We felt like we were doing something wrong. Maybe we were laying him down too much and not holding him enough, or maybe we weren't giving him enough tummy time. He has slept on his back since the day he was born and we were afraid to change that because of the news S.I.D.S. warnings. My wife and I have been taking our son to a pediatrician since he was six days old. The pediatrician is the one that first made a comment about his head and said that we needed to work with Liam to correct the problem. She referred us to a Pediatric Physical Therapist for a consult. 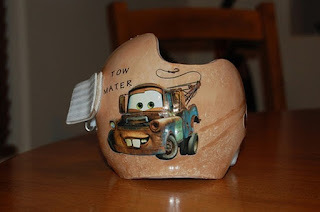 We went to the consult and that is where we first learned about the Torticollis and that the lack of nect muscle development could be what was causing the misshapen head. The P.T. Specialist gave us stretching instructions and we signed up for six visits. There is a concern with the combination of Torticollis and head flatness, that Liam would develop a little more slowly than he should. The P.T. Specialist has a chart that talks about the milestones that Liam should have started doing and he is behind about a month or so according to the chart. We hoped that between the P.T. and doing exercises with Liam at home, that his neck would correct itself and his head would take the correct shape. Although there has been some progress, the neck is still underdeveloped and his head was still flat in the back. It was recommended by our pediatrician and our P.T. Specialist that we put Liam in a DOC Band (Dynamic Orthotic Cranioplasty). We were a little apprehensive at first because my wife and I have both seen infants in these bands and our first reaction is that something is wrong with the baby. 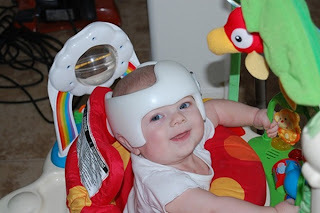 I began doing some research and quickly discovered that its a corrective device for reshaping babies heads who suffered from either Plagiocephaly, Brachycephaly or Scaphocephaly. 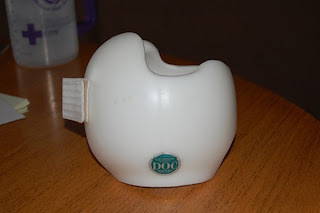 I also discovered that the D.O.C. Band is VERY expensive and most insurance companies consider it a cosmetic device and do not cover the cost ($3,000). I located a blog of D.O.C. Band customers and I was amazed at how many families use the band. I read some great stories of success and some sad stored about the financial hardship, but I did not find one person mention that the treatment was unsuccessful. In fact, Cranial Tech boast about their 100% success rate. My wife and I set up a consult with Cranial Tech and we were very pleased with their kindness and professionalism. They were gentle with Liam and did as much as they could to make him comfortable and happy. They took some digital images and measurements of his head and were able to show us that his head shape was not normal and needed to improve. They recommended that we put Liam in the band immediately. We scheduled an appointment and went home and thought long and hard about it. We talked about the financial cost for a while because it is staggering; however we were not deterred by it because we wont put a price tag on Liam's wellness. We wanted to make sure that if we spent $3,000 for a piece of foam and plastic, that is was going to be money well spent. We discussed our decision with friends and family and weighed our options. We decided that putting Liam in the band was the best option for us. We were happy that Cranial Tech offers a few different financing options to help ease the financial hardship. Rather than come up with $3,000 cash for the band, we were able to get a GE Money bank care card with zero percent interest for 18 months! We applied online and received instant approval. We printed the approval, took it with us to our next appointment, signed a few pieces of paper and that was it. It felt too easy; almost like we were missing some catch. So far, there has been no catch. Liam had his first appointment three weeks ago where he was fitted for his band. Previously, a fitting required a full head sock, plaster and about an hours time; a very traumatic experience for infants. About four months ago the went complete digital so we were in and out in 20 minutes. If was a great experience for us because it was painless and the staff at Cranial Tech was so nice to us. We scheduled an appoint again for two weeks out to have Liam's band installed. The band installation was simple. They tried it on is head, made a few minor adjustments and we were on our way. The first two days we were instructed to remove the band every three hours to check for red spots on Liam's head. If red spots were present, we needed to wait until the redness went away before we put the band back on Liam's head. Other than some cleaning instructions, there was nothing else to the band. We now have weekly appointments to have Liam's head analyzed and the band adjusted; all covered in the $3,000 initial cost by the way. As of today, July 23, 2007, Liam's head has already started changing. It looks wonderful! Where his head was flat, you can see roundness. His face is changing and starting to correctly align itself. It's truly amazing how much progress he has made in just a few days! I'm going to write more about his progress when we are about half way through the anticipated eight weeks that Liam is supposed to be in the band. Here is a photo of Liam's band after we painted a theme from his favorite movie. thanks for posting your story. our son just got his helmet today from cranial and i am so nervous that he might be feeling uncomfortable or too much pressure on his head. he doesnt show any signs that he is uncomfortable. i guess as a mom I am just worried we are making the right decision. This is a Flickr badge showing public photos and videos from Crystal & Billy. Make your own badge here.